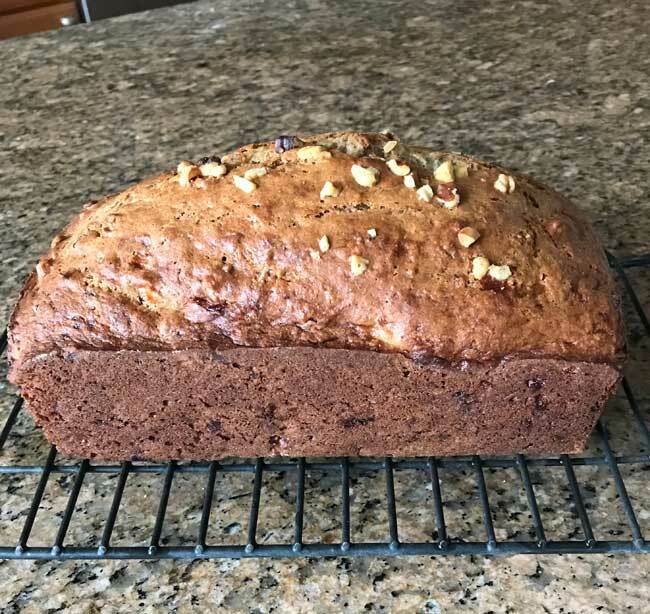 Cottage Cheese Banana Bread is an easy banana bread with cottage cheese in it. Preheat the oven to 350 degrees F. Grease the bottom and short sides of an 8 ½ by 4 ½ or a 9x5 inch loaf pan and line with a strip of parchment. Grease again, only going up about ¼ inch up the sides, then dust with flour. Mix together the flours, sugar, baking soda, salt, salt and cinnamon. In a large bowl, mash the bananas with a fork, then stir in the cottage cheese, eggs, and vanilla. Pour the melted butter and oil over the batter (don't forget this step! It's easy to forget the butter since it's usually not added last) and stir with a heavy scraper until well blended – do not overbeat, just gently fold. Stir in the nuts (if using). Transfer batter to the pan and spread evenly. I've also successfully used bread flour. The protein in the bread flour and cottage cheese makes the loaf a little sturdier (in a good way) and easy to slice.